Linda Burton posting from Denver, Colorado – I’m in Denver now, just a hundred miles south of Cheyenne, and the cats and I are settled in, ready for new discoveries. I’ve left the Cowboy State for the Colorful State, according to the Welcome signs, although I saw nothing but brown hills where I-25 brings you in. I left a hotel with roofers hammering madly overhead and endless trains across the street for a hotel with an inner brick courtyard and roses blooming by my window. Freeway traffic got heavy as I approached big-city life; I traded wind and trains for roses and traffic, I chuckled to myself. The highlight of my day was a stop about halfway between Cheyenne and Denver, in a town with the lovely name of Loveland. 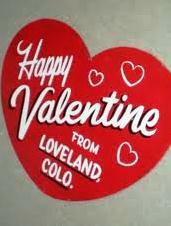 Also called “The Sweetheart City,” one of Loveland’s claims to fame revolves around the little Cupid guy that flies in sometime in February; that would be Valentines Day. Want to mail a Valentine to someone special with a hand-stamped message of love on the front and a postmark of “Loveland”? Loveland has been re-mailing Valentine cards and love letters for more than 66 years now; they come in from all 50 states and more than 100 countries around the world. It’s the largest program of its kind in the nation, and here’s how it works. The Loveland Chamber of Commerce holds a contest each year for artistic designs and verses; this year Corry McDowell won with a design of hearts going around the world from the hands of a cute cowboy; Phyllis Kennemer’s winning verse was: Valentine greetings from a city with heart, Loveland, Colorado, home of fabulous art! The Loveland Post Office then commissions the art for the hand cancellation used to cancel the postage. Beginning the 1st of February, volunteers gather at the Loveland C of C to begin hand stamping the cards that come in; they get an average of 200,000 each year. Most of the cards are addressed to individuals unknown to the stamping crew, but some of the famous recipients have included Dear Abby and President Obama. To participate, just send your pre-addressed card (with the proper postage affixed) in a larger 1st class envelope to the Postmaster in Loveland; go to www.loveland.org for deadlines. You don’t have to wait till Valentines Day to see hearts in Loveland though. 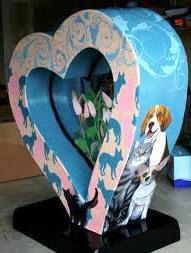 The City With HeART program that has been going on for the last six years has, so far, resulted in more than 20 five-foot high fiberglass hearts strategically placed around the city. The hearts are sponsored by local businesses or individuals; clever designs (and names) such as “Lego My Heart” and “Modern HeArt” attract attention; I brought out my camera for more than a few brilliant eye-catching hearts I spotted while driving around. 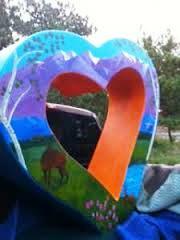 Loveland was the first Colorado city to pass an Art in Public Places ordinance; that was 1985. That means one percent of the city’s capital construction projects goes for the purchase of art; the city boasts a collection of more than $6 million worth of bronze sculptures, paintings, photographs and fiber pieces. 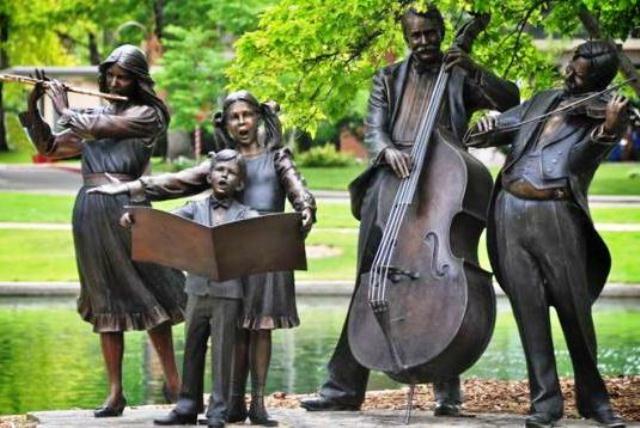 You’ll find these works of art on the way to the grocery store, in residential neighborhoods, in front of banks and offices, in parks, and on playgrounds. There are almost 300 bronze sculptures alone; 131 pieces are on permanent display at Benson Sculpture Garden; 82 stone sculptures can be found at Chapungu Sculpture Park. 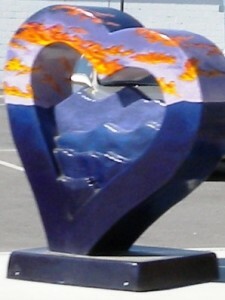 Many people visit Loveland as an art destination; it is recognized as one of the top 10 art communities in the country. I was just passing through, but sing its praises now.